business conference for my other business I have, the home cleaning company, there was someone there called Simon Moore who told us about the history of the Turtle Mat and why he bought the company. He also did a demonstration and afterwards we managed to get one of the doormats at a discount. Anyway since we have had it in the house there's been an amazing difference, it really is a washable doormat that works! No wet footprints across our hall and no spoiling of the lovely clean floors, especially after they have been cleaned. Really I think that it just fantastic and we are going to get one for my back door, we haven't got one there at all and it's a real pain when coming back in from the garden especially when it has been raining, one for our office back door, the guys bring in dirt into the office and our office carpet really does need cleaning, and one for our home bathroom as we think it will stop us getting the bathroom wet. So what else can I say, if you really want to keep your house clean your really need to think about getting a doormat that works, one that really gets your shoes completely dry and that mat is a Turtle Mat. At our regular weekly meeting last Thursday it became apparent that one of the vans tanks wasn't heating up at all. It meant that we had to rearrange the jobs for the day for that van. The problem was the heating element in the dipping tank fitted to the van was tripping the electrical circuit in the office. We checked the element and it had completely 'gone' and needed replacing. So on Saturday I removed the tank, fitted a new element and then put it all back together in the pouring rain. It was a bit tricky in parts as I had to get the tank completely out of the van to get leverage on the element to remove it. To do this I had to unbolt the fixing bolts, get the tank out ,then put the new element in and then bolt the tank back into the van. To do this bit needed a bit of effort but I got it all sorted out in the end. So at the end I was soaked through to the skin but it had to be done. Today we have put the same van into the garage get a wheel bearing fixed. Now the van is fixed and I will use it tomorrow for a full day's work. I cleaned an AGA cooker last Wednesday and it was tough. I think I mentioned in my previous blog that it was very dirty. Well as I have been aching for four days now I think I need to add that it was very very dirty and the effort to remove all the burnt on carbon was immense. It was one of the hardest AGA cookers I have had to clean. I think adding the cleaning of the service accommodation on the same day , I cleaned four single ovens, didn't actually help but when you need to get something cleaned in a set time period and you really have to go for it to get it cleaned then it becomes very hard work. On the AGA the inside of the doors were black, the underside of the simmering lid was black and the "tunnels" just inside the ovens was black too. As all these services were aluminium then there are only a limited number of ways to clean them; all involving lots of elbow grease. Aga Cleaning – Some Transformations Are Tough! 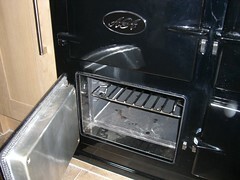 Today I cleaned a two oven AGA cooker that had been bought by the owner 35 years ago for the princely sum of £400. Apparently it was cheaper as there was a problem with the towel rail on the front. It took me about 3 hours to clean it; this is longer than usual as it was very dirty. In fact the owner told me that it hadn't been cleaned since new. The inside of the doors and the simmering top plate lid were particularly thick in carbonised grease. For the dirty ones it just means a lot more effort is required in getting off the grease and burnt on carbon. I managed to get it all off and it looked very shiny and sparkling when I had finished. Chris Cardell. For me cleaning AGAs is very satisfying so I don’t mind at all. So two AGA cookers left set ready, and looking fabulous, for Christmas. state. They want them looking lovely. It really gives a good impression if they look great.